I am proud to say that I was the catalyst for the ABA Commission on Ethics decision, affirmed by the House of Delegates, to modify Rule 1.17 to allow lawyers to sell a practice area and still remain in practice, although not in the area sold. 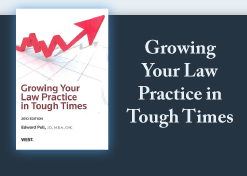 The practical focus of Rule 1.17 is the sole and small firm practitioner. Large firms don't sell their practice. They can break up, merge, combine, or move entire practice groups from one firm to another. But they don't "sell" their practice, or at least they don't call it that and thus they sidestep Rule 1.17. Partial practice sale has been adopted by the states that follow the ABA Model rules and is slowly being adopted by others as well. But, the change has not yet been adopted universally. This year the State Bar of California proposed four pages of changes to its rules on buying and selling a practice that, among other things, would require the selling lawyer to divest all of a practice or field of practice, and to cease engaging in the private practice of law once the sale is complete. The recently adopted Illinois model rule requires the sale of the entire practice without allowing for a transition to occur, whereby the selling lawyer can continue to practice under the aegis of the buying lawyer to facilitate the likelihood the existing clients will stay with the buying lawyer, assuring the value of the practice purchased. In other words, when an escrow for the sale closes after notice is given to clients in accord with the rule, the lawyer must stop practicing, period. Interestingly, there apparently has been no discussion in Illinois concerning the length of escrow. The only time discussion is the minimum notice of sale to be given to the clients. What if there were an extended escrow, for example, one year or some other time constraint desired by the buyer and agreeable to the seller? Without such a provision, the only alternatives for a small firm lawyer are remaining in practice until death, or arranging an immediate buyout and pursuing some activity other than law until death. These are bleak choices and, in my opinion, contrary to the spirit of what the ABA General Practice Section originally advocated for Rule 1.17. The more reasonable interpretation should be that this rule was intended to facilitate a retirement transition in which the sale is complete but the selling lawyer continues to assist in the transition of client relationships. Ultimately, it is the clients who benefit when they are smoothly transitioned to receive competent representation from a qualified buyer. That is truly the way to protect the public, which is the stated goal of the Bar. Last week, I saw Love & Other Drugs, with the gorgeous Anne Hathaway. I wish I had known the subject of the film before I saw it. I would have been better prepared. While it's advertised as a great "chick flick," and had the beauty and beast as lead actors, the underlying subject matter was serious: Parkinson's Disease. This hit too close to home for my personal comfort. The message was serious and the hope expressed was phenomenal. Even people with the disease can lead a productive life. For example, Michael J. Fox, perhaps the most well known person today with the disease is still acting. He did an incredible job in The Good Wife a few weeks ago. If you didn't see it, you should rent it. There is an incredible colloquy between the lead actress and Fox about the pricing of legal services in a contingency matter. Go see it.